Kim Curtis is a nationally recognized wealth management advisor and speaker. As President and CEO of Wealth Legacy Institute, her groundbreaking work in developing a highly personal client-centric planning model was recognized in the Journal of Practical Estate Planning, winning the Editor’s Choice award. This model is the cornerstone of her firm’s holistic and highly successful approach to integrated wealth management, The Planning for LIFE Experience™. 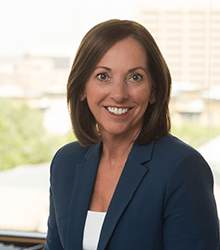 Kim has attained numerous professional designations and been recognized by the financial planning industry as having achieved the highest level of competence and expertise. Ms. Curtis is a bestselling author of Money Secrets: Keys to Smart Investing published by Financial Literacy Press. Kim has spoken on leadership, negotiations and finance to organizations such as West Point, Oracle, EPA, University of Colorado Hospital, Comcast, Level 3, CenturyLink, OtterBox, Johnson & Johnson, AAUW, amongst others. She has been profiled on NBC, CBS, ABC, FOX, CW as well as the Wall Street Journal. During her free time you can find her sailing, skiing or golfing in the beautiful Rocky Mountains, or her favorite guilty pleasure, reading People Magazine.